there is a mirror behind these shoes - I didn't sew that many! At the end of last year's fete season someone donated two large pieces of cream/beige leather. 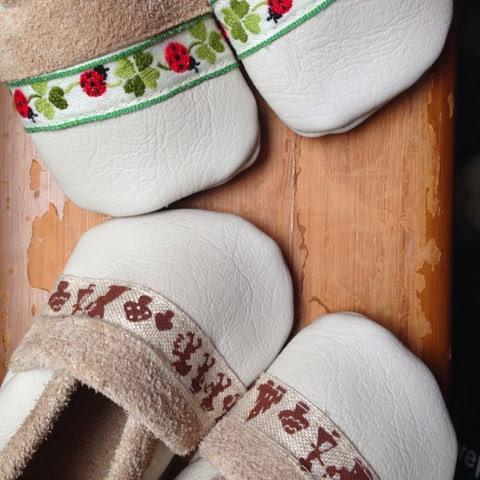 We had, by that time, sewed and knitted and stuffed so many things that the prospect of turning that leather into anything was just too daunting. I put it away with the rest of the craft supplies and forgot all about it till a couple of weeks ago when I was looking for some old jumpers to re-purpose. I had not a clue of what to make with it, but brought it home with me in case inspiration struck. I quite like this sort of crafting - letting the supplies to hand dictate the product rather than the other way around. 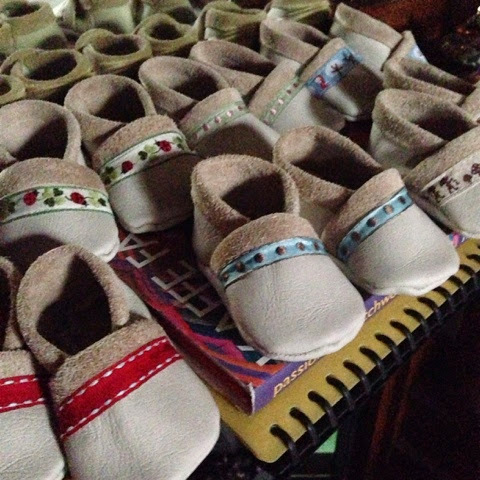 Years ago, before Grace was even born I think, I made a heap of little baby shoes. 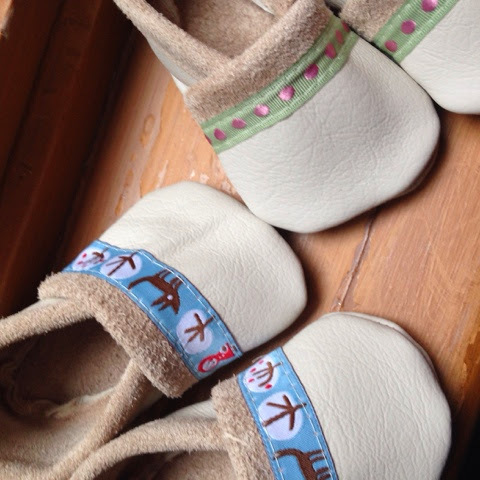 At one time, if you knew me and had a baby, you were fairly sure of getting a pair of handmade babyshoes from me. 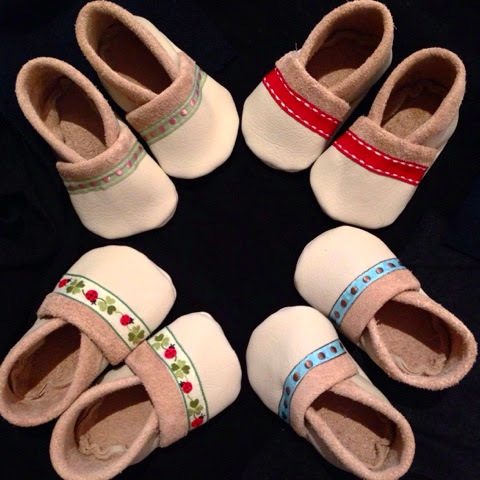 My very first foray into internet shopping was the purchase of ribbon to stitch across the toes of tiny shoes, which is why I still have a bundle of ribbons, quarter of a yard in length - a fairly useless quantity of ribbon for any purpose other than to decorate the front of a baby shoe. After making about 8 or 10 pairs I tired of them. They were terribly fiddly, requiring outer fabric, inner fabric, iron on interfacing, threading of elastic and stitching of ribbon. I stopped making them and never bothered again. Until now. 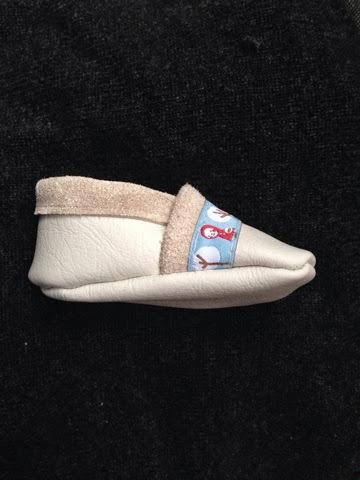 This bit of leather looked like it might just work as a baby shoe and I dragged out the old pattern, modified it to work with leather and without lining or requiring the elastic to be threaded through the front casing. 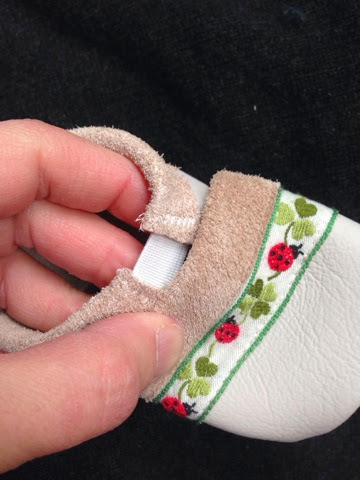 There are a million baby shoe tutorials around, the one I based this shoe on was from Michael Miller fabrics but there are plenty of similar ones about. I've never sewn leather before, but my machine handled it beautifully and it was lovely to work with - almost like thick felt. No ironing, turning under frayable ends or bothering about interfacing. Instead of threading the elastic all the way through, which would be nearly impossible, I stitched a strong piece several times to each side of the top casing. No great flexibility is required- just enough elastication to enable the shoe to be slipped on and enough to ensure it won't slip off. I used up some of my stash of ribbons too. Sadly I don't have anymore little feet for these, but I hope they'll appeal to others who do.